Here is 6+ minutes of silent footage of the Channel Island Fox (Urocyon littoralis santacruzae) taken June 1, 2013 on Santa Cruz Island in the Channel Islands National Park. This trip was organized by the Friends of the Island Fox, a non-profit group dedicated to preserving the Island Fox and helping it recover from near extinction. 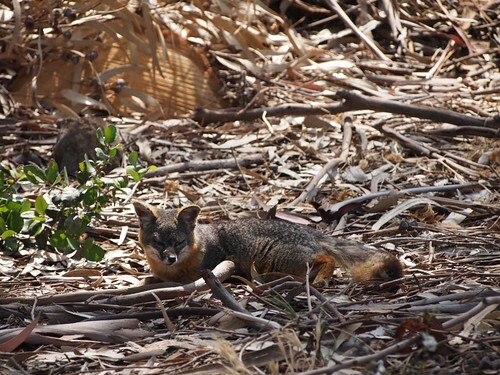 The footage show island foxes exhibiting natural behaviors at the Prisoner’s Harbor landing area on Santa Cruz Island. On June 1, 2013, we joined the Friends of the Island Fox for a trip to Santa Cruz Island, part of Channel Islands National Park. After a 1.5 hour boat ride to Prisoner’s Harbor, we hiked about, inspected the newly restored wetlands, saw the Channel Island Scrub Jay, island specific flora and, of course, the Channel Island Fox, an endangered species that only lives on the Channel Islands of California. “The island fox shares the Urocyon genus with the mainland gray fox, the species from which it is descended. Its small size is a result of insular dwarfism, a form of allopatric speciation. Because the island fox is geographically isolated, it has no immunity to parasites and diseases brought in from the mainland and is especially vulnerable to those the domestic dog may carry. In addition, predation by the golden eagle and human activities devastated fox numbers on several of the Channel Islands in the 1990s. Four island fox subspecies were federally protected as an endangered species in 2004, and efforts to rebuild fox populations and restore the ecosystems of the Channel Islands are being undertaken. Radio collars are being attached to foxes in an effort to track and locate the young foxes. To date these efforts have been largely successful.